The outgoing president, aware that the Stargate Program will one day be made public, uses the occasion of the 1000th trip through the stargate to authorize a documentary film chronicling the SGC. Filmmaker Emmett Bregman finds a less than warm reception at the SGC, and Hammond agrees to cooperate only to the letter of his orders. Daniel is unable to elaborate about the experience of ascension, Teal'c's stoic silence and Carter's enthusiastic technobabble hardly make for riveting footage, and O'Neill manages to deftly avoid the camera at every turn. Most frustrating of all, Bregman is absolutely denied access to any ongoing activity. SG-13, under the command of Colonel Dixon, arrives on P3X-666, and archaeologist Balinsky is ecstatic to find the ruins of an Ancient city. As he works, Airman Simon Wells passes the time with his teammates and shares a sonogram image of his unborn child. Suddenly, a hovering probe appears and fires at the team. SG-13 returns fire, disabling the device, and sends it back to the SGC for study. Meanwhile, Dr. Lee and Sergeant Siler demonstrate a prototype ceramic polymer vest, and Senator Kinsey offers a hypocritically grand prepared speech as Bregman continues his futile attempts to capture the SGC on film. Unable to document ongoing missions, Bregman approaches Daniel and suggests that he take the opportunity to occasionally use his video camera to record action rather than artifacts, but he only seems to find cooperation from Dr. Fraiser, with whom he develops a rapport. Carter and Daniel study the recovered alien probe and discover that it had sent a remote transmission before it was destroyed. However, the warning to SG-13 comes too late. They come under fire from Jaffa ships, and Airman Wells is severely wounded. Despite fear of an ambush, Hammond authorizes a rescue mission, and the teams depart through the gate. O'Neill leads three SG teams and Dr. Fraiser on a rescue mission to P3X-666 where SG-13 is engulfed in a firefight with an army of Jaffa. As the battle rages, O'Neill is struck in the chest by a staff weapon blast and falls to the ground, unmoving. When the teams return to the SGC, Carter is visibly distraught, and there is word of casualties, but filmmaker Emmett Bregman's inquiries meet a wall of silence. Richard Woolsey of the NID is sent by Senator Kinsey to review Hammond's command decision in ordering the rescue, but he too finds little cooperation as he interrogates Carter, Daniel, and Teal'c. Bregman requests access to Daniel's videotape, in which he captured his and Dr. Fraiser's desperate attempts to save the life of Airman Wells. However, when Hammond is finally ordered to turn over the tape, Bregman watches in horror as the critically wounded Wells pleads to say goodbye to his wife, a staff weapon fires - and Dr. Fraiser is struck. Now, days later, Airman Wells is recovering, a prototype vest has saved Colonel O'Neill, but Dr. Fraiser is gone. At the memorial service, Carter honors Fraiser's memory by recalling the names of the many people who are alive today because of Janet Fraiser. Airman Wells has nearly recovered, and Daniel visits him at his home. There he meets Wells's wife and newborn daughter, whom they have named Janet. At the SGC, the first cut of Bregman's documentary is completed, and it is not the invasive reality piece that Hammond expected. It is instead a powerful and touching homage to the men and women who serve their country. With profound respect, Hammond promises his cooperation in obtaining the final piece that would make the film complete. Finally, a deeply moved Colonel O'Neill willingly sits before the camera to add his support to Bregman's tribute. This episode aired in two parts. The official purpose of the documentary is to chronicle the 1000th trip through the stargate. The unofficial reason probably has more to do with political posturing since the current president is leaving office and doesn't want to look bad if and when the stargate program ever goes public. Senator Kinsey and his running mate are running for election to the presidency. SG-13 found the ruins of a city built by the Ancients on P3X-666, and no sign of recent Goa'uld activity. P3X-298 is the planet from which Daniel recovered a mask fragment that was carbon dated to match the predynastic period of Egypt here on Earth. P2X-787 is the planet which SG-13 had earlier explored and had encountered a particularly scary alien comparable to the ultrasound image of Well's unborn child. The list of O'Neill's injuries includes: severe hypothermia, nanite technology artificially aging him, shoulder punctured by an alien time capsule device, three knee operations, the whole Hathor incident he's asked never to be discussed, and exposure to an ancient incurable disease, but fortunately there was a Tok'ra symbiote in need of a temporary host at the time that managed to do the trick. The Earth gate draws 10% more wattage than off-world gates, probably due to the way that the super-conductive crystals inside the gate absorb electrical energy, but also possibly due to the DHDs somehow producing a purer, more efficient form of power. Kevlar will not stop the energy blast from a staff weapon. The armor plating in other bullet-proof protection gets super-heated from the plasma, so while it would stop the penetration, the wearer is essentially trapped in what becomes their own personal microwave oven. Dr. Lee has developed a new ceramic polymer that will resist the heat, stop the blast, and fits into a standard-issue SG vest. SG-13, under the command of Colonel Dave Dixon, with Bosworth, Wells, and Balinsky, completed the mission to P3X-666. Senator Kinsey is the Chairman of the Intelligence Oversight Committee, and has asked that Woolsey review Hammond's command decision regarding the recent attempted rescue of SG-13. Woolsey is authorized to begin a full investigation into the matter as part of a larger examination of SGC strategic policy that the Committee is preparing for the President. Woolsey has an MBA and LLB from Harvard, was lead counsel for the Army Corps of Engineers for ten years, and later sat on the Defense Policy Board. He was asked to resign last year when it was disclosed that he had financial ties to a large corporation that had been awarded over $800 million in private sector defense contracts by the Pentagon, and has been with the NID since then. After the ambush on P3X-666, SG-1, SG-5, SG-7, and Fraiser were sent as backup. 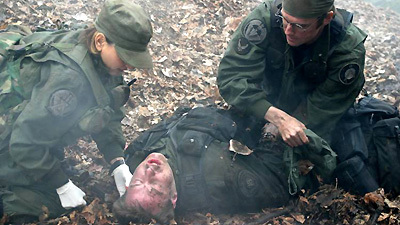 They are later listed as SG-1, SG-5, Fraiser and the medical team, giving the impression that SG-7 is a medical team. The standing machines at the back of the gateroom have several purposes, not including Space Invaders. There were film cameras on the beaches of Normandy decades before "Survivor" debuted on CBS.